Update, August 2014. NASA has now committed to fully funding the Cassini mission to it's planned end in 2017. NASA’s shrinking budgets for planetary exploration may force it to decide between continued funding for the Saturn Cassini mission and the continued funding for its Mars missions. Mars would seem to be the likely winner. If so, we would lose a dramatic ending to the Cassini mission that would be essentially an entirely new mission to Saturn. The ring and cloud-top grazing final orbits would produce entirely new science and would be as rich as the Juno mission to Jupiter. Note: I've corrected this post to reflect Cassini extended mission costs of $60-65M per year instead of the $50-55M in the original post. 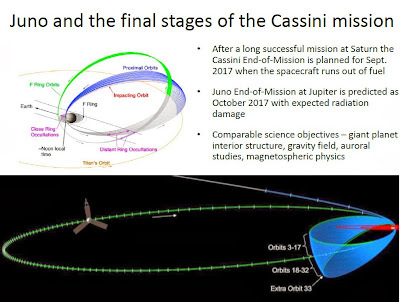 Comparison the possible end-of-mission orbits for Cassini and the orbits for Juno. By dipping close the rings and atmosphere, Cassini can make highly detailed measurements of the rings, atmosphere, and Saturn's interior. The Juno mission en route to Jupiter will provide similar measurements for Jupiter's atmosphere and interior. Source: NASA's Outer Planets Assessment Group (OPAG). The initial costs of operating a mission during its early phases, what is known as the prime mission, are included in the funding budgeted specifically for the mission. 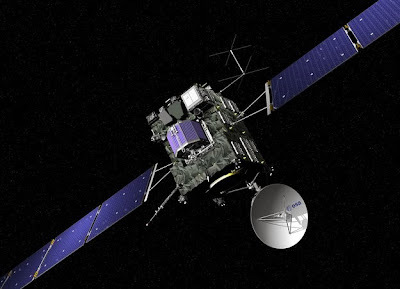 Once a spacecraft continues operating past its prime mission (most do), it enters what is known as an extended mission. NASA budgets money to operate extended missions. The amount planned for the next several years is fixed and doesn’t go up with the number of extended missions. As a result, there’s a process known as the Senior Review that judges which missions should continue to be funded and at what levels to divvy up the pie. For the past several months, NASA has been warning the planetary community that there will be insufficient funds to operate its all extended missions at their current levels. The Senior Review encourages mission teams to both be clear on what new science is enabled and to find ways to continue to operate on smaller budgets than were used for operations in the prime mission. It’s not unusual for the science return in an extended mission to equal or exceed that of the preceding prime mission. In the prime mission, it’s not unusual for new discoveries (e.g., the plumes of Enceladus) to be made, but scientists aren’t sure what they mean or what processes drive them. Those discoveries become the subject of follow up observations (e.g., multiple passes through the plumes to conduct a variety of targeted measurements) that greatly deepen our understanding. Many processes simply require a long period of time to observe. For example, the Mars Reconnaissance Obiter has imaged and re-imaged many seemingly blank spots on the surface of Mars. At some of those spots, small meteor strikes revealed ice lying just below the surface. The ice later sublimated away; only repeat imaging revealed the ice during the brief time it was visible. An extended mission may allow the spacecraft to move to a new location for entirely new observations. The extended mission of the Opportunity rover has allowed it to essentially become a “new” mission at least twice by arriving at locations that were considerably different than those visited in the prime mission. In another example, the lunar GRAIL orbiters used their extended mission to map the moon’s gravity field from a much lower (and riskier) orbit than the orbits of the prime mission, resulting in higher resolution maps. Demand up, budget flat or down, something may have to go. Cassini has had a long run at Saturn, having entered orbit in 2004 and been operated as an extended mission after the first four years. Between the end of its current extended mission in late 2014 and the time the spacecraft is expected to run out of fuel in 2017, the spacecraft could continue to follow up on past discoveries (for example, with three final Enceladus flybys). It also would continue to look for seasonal changes at Titan and Saturn. However, in its last year of possible operation before its fuel is exhausted (November 2016 to September 2017), Cassini could become an entirely new mission. Following these orbits, the spacecraft would slip into the gap between the inner most ring and the top of Saturn’s atmosphere. From these 22 close-in orbits, the Cassini mission would essentially replicate the measurements that will be made at the same time by the Juno mission to Jupiter: detailed measurements of the interior of Saturn and of its atmosphere. As a bonus, scientists can make more detailed measurements of the rings. And for all of us who vicariously explore the solar system through these missions, think of how beautiful the images would be looking out at the rings and Saturn from just above the clouds. At the end of the mission, its fuel gone, Cassini would enter and burn up in Saturn’s atmosphere, an end that would prevent it from accidently impacting and contaminating Enceladus or Titan with micro-organisms from Earth. 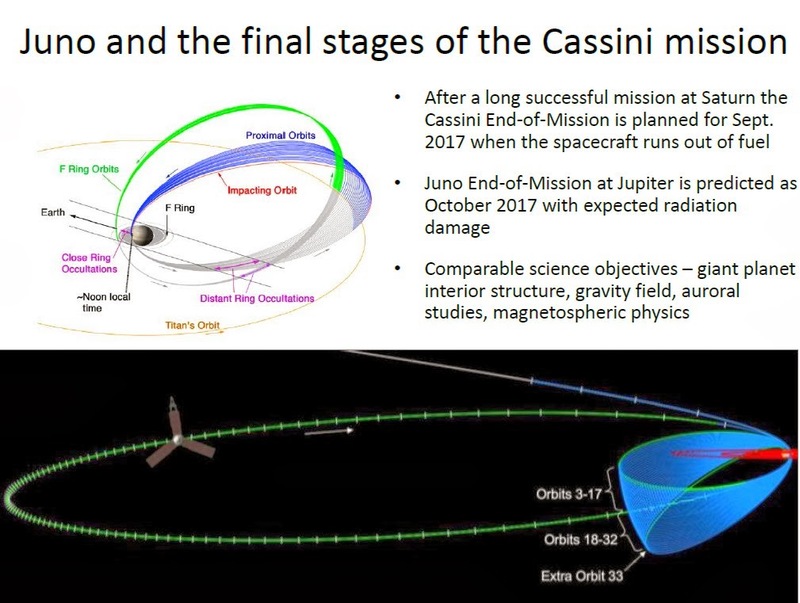 All of the science in this end-of-mission scheme would be new, never done before science because extending the mission would allow Cassini to go to somewhere new. NASA thought that these measurements were so valuable at Jupiter that they funded and are flying the ~$1B Juno mission, which will do similar science there. At one time, funding for Cassini’s full extended mission to the end of 2017 had been approved. Then NASA’s planetary budget was cut and now the mission has to seek approval again to continue operating. However, the real solution is for NASA to receive more funding so that it doesn’t have to make choices that turn off a highly productive mission to save 4% of its planetary science budget. If you would like to see Cassini make those final orbits, skimming the rings and Saturn’s atmosphere, I encourage you to join the Planetary Society’s campaign to have NASA’s budgeting program receive more funding. For those who like to see the numbers, I’ve gone through NASA’s Fiscal Year 2014 budget proposal to pull out the planned budget for extended missions and the budget for Curiosity’s last year of funding in its prime mission. The budget doesn’t break out funding for the Cassini or Lunar Reconnaissance orbiter. Public accounts have put the Cassini extended mission operations at $60M to $65M a year. The MESSENGER orbiter at Mercury is expected to run out of fuel before the start of FY15, and will not be needing funds beyond FY14. All extended missions currently are funded through the end of FY14. The crunch begins in FY15 when the budget numbers show a funding cut and Curiosity needs new funding to begin its extended mission. While NASA’s budget documents don’t show spending categories within the Outer Planets budget category, the chart below shows sharp cuts to this account. By FY16, funding is too low to support the Cassini mission (and may represent NASA’s contribution to Europe’s JUICE Jupiter/Ganymede mission). There may be some funding for Cassini in FY15. Proposed budgets following FY16 show approximately flat funding. While it’s disappointing the ESA did not select a planetary mission, Europe will make strong contributions to planetary exploration in the next two decades with the Rosetta mission rendezvousing with a comet (2014), a Mars orbiter (2016), a Mars rover (2018), the Bepi-Colombo Mercury orbiter (arrives 2022), and the JUICE Jupiter and Ganymede orbiter (arrives 2030). This is in addition to the currently operating Venus and Mars Express orbiters. Europe can still select planetary missions for its Medium-scale program. The Marco Polo-R asteroid sample return mission is currently in consideration for the next selection. ESA’s Mars program is also funded separately and is looking at missions for the 2020s.